Enhance your home network with a Gigaset wireless USB stick. Easy to install and featuring a handy design, the Gigaset USB Stick 54 simply slots into your PC or laptop to enable wireless connectivity with any wireless router. Data transmission rates of 54 Mbps ensure you can comfortably surf the net from up to 30 meters away indoors or 150 meters outdoors. 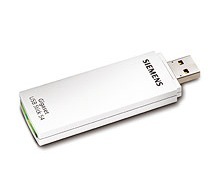 SIEMENS Gigaset USB Stick 54 is based ZyDAS ZD1211B chip.